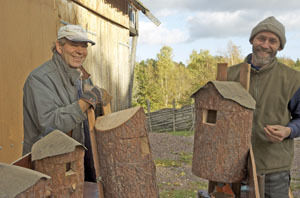 Nature conservation is a matter of course for Urnatur. 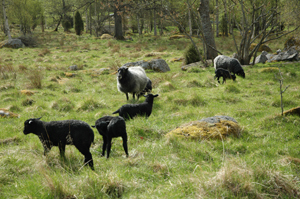 We want our little farm Sjögetorp to be a living ecological farm, with animals grazing the natural old pastures. We keep the old breeds “pälsfår”, now also called Gotländska utegångsfår, a kind of sheep with the most beautiful skins and tasty meet, and the reddish hornless little cows that are called “rödkulla”. Also we keep some friendly hens for the eggs. They are a mixture of old breeds and lay eggs in all colours. Of course we want to protect and preserve the biodiversity of this place. 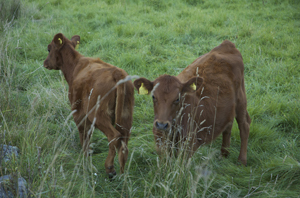 To favour the endangered species that belongs to our meadows, we are making hay with the scythe in late July so the seeds can sow in again. We like to use lokal traditional materials and techniques. 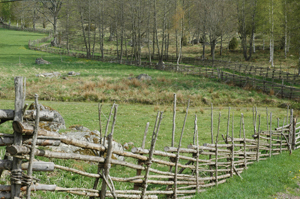 Therefore Håkan has built nearly 3 km of beautiful traditional gärdesgård fences that border our pastures and fields. They are made of spruce, sprucetwigs and juniper.